What makes a car bad? Well, it could be a dreadful interior or perhaps an uncomfortable ride. It could also be poorly made and unreliable. Of course, it could also be a combination of these things. Over the years, many cars have had one, two or more negative traits, but this does not mean they were the worst cars ever made. No sir, there have been cars made that not only have these negative traits, but they also have absolutely no redeeming qualities of what makes a car good whatsoever. Over the years, vehicle manufacturers and designers have rolled out many cars which probably never should have left the production line. There are many bad cars out there to be sure, but some are so bad they made it to this list. These are cars so bad that should you lose the keys to them or lock your keys inside of them, you shouldn’t even bother calling Bostons Locksmith, your car locksmith in Boston, because it is best to just let it go, man. Any car that tended to erupt into flames after a low-speed rear-end collision definitely deserves a spot on this list. What makes things worse is that the brilliant leadership at Ford decided it would be more cost-effective to just pay off settlements brought by victims than recalling and fixing the problem. While Chevy consistently pumped out quality muscle in the 60s and 70s, this little stinker was also unveiled. With an engine boasting a mere 51 horsepower, the Chevy Chevette had a difficult time outrunning golf carts. It did, however, win the hearts of thousands of teenage girls who thought it looked pretty rad. Thankfully, America isn’t the only country to produce duds. The Serbian-made Yugo was an initial hit when it first arrived in the states and sold nearly 50,000 units in 1987. But by 1992, sales plummeted to under 1,000 as people began to realize the engine was prone to failing right around the 25,000-mile mark. The quality of the Saturn Ion is so bad that it attributed to the eventual downfall of Saturn. A 2014 recall of 2.6 million cars included every single Ion ever made. The first-generation Mustang is a classic that is still revered and admired today as a class-act muscle car. The 1974 Ford Mustang is a piece of garbage with a four-cylinder engine that spews out a measly 88 horsepower. The Suzuki X-90 was supposed to be a little off-road car. The reality is that is was a car that you couldn’t tell which end was which and it struggled to get over a dirt road. Poor driving dynamics and awful styling made this retro-styled car go very wrong. Go ahead and look this beauty up on Google and come back when you are done. You see that? We don’t even need to tell you why this is one of the worst cars in history. And yes, it did tip over when taking a turn. 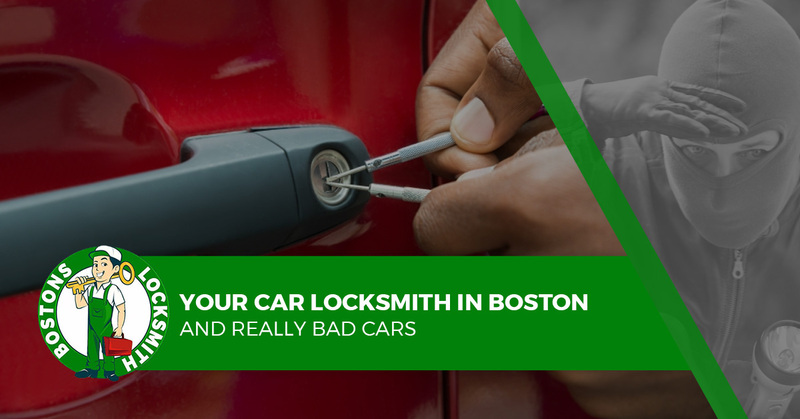 If you don’t have one of these cars and locked your keys in it, give Bostons Locksmith a call.